As an invisible disability, hearing loss can sometimes go ignored. Oftentimes, hearing impairments go ignored for years or even decades - even by the person experiencing it. Once hearing loss is accepted and addressed, it can still be downplayed or disregarded, even by the people that are closest to us. Hearing can be exhausting and daunting with hearing loss. If someone you love may have hearing loss, it is important to understand these things that people with hearing loss wish everyone knew. When you have a hearing loss, hearing, listening, understanding and communicating can be extremely difficult. Even with advanced technology to help ease the task of holding conversations with multiple people in noisy environments, it still takes more brain energy for people with hearing loss to complete these tasks than those without it. Please understand that those of us with hearing loss are doing our very best, and may just need to retreat to a quieter area from time to time to regroup. We’re not rude, we’re not ignoring you, and we are certainly not stupid. With hearing loss, it is possible to miss the topic of conversation from time-to-time or misunderstand and therefore inappropriately reply. This is not because we are stupid or unable to communicate; it simply means we misheard a key part of the conversation. Also, if we do not respond to your quiet greeting or “excuse me”, we are not being rude or ignoring you, we just did not hear what you said. We do not need anyone to speak for us. We understand that most of the time this comes from a place of sincerity, however, we are not children or incapable. If someone asks a person with hearing loss a question that they did not hear, do not simply answer the question for us. Instead, repeat the question to us or let us ask the person to repeat their question so we can properly answer in our own words. Hearing aids aren’t the same as glasses. Unfortunately, the auditory system is extremely complex and hearing aids have not reached the same level of intervention for those with hearing loss and glasses have reached for those with vision impairments. With glasses, once they are on one’s face he or she can most often see as well and as effortlessly as those without vision loss. With hearing aids, the story is not quite the same. Hearing aids make listening and communicating with hearing loss significantly easier; however, that does not mean that it is as effortless as those without hearing loss. We often still require some modifications and a few more reputations than those without hearing loss. Very small actions on your part can make a big difference for us. Everyone with hearing loss will have their own tips and tricks that work best to help them better understand conversations. For most people with hearing loss, it is important not to try to communicate from a different room or from a very far distance. Most people do better when they can see your lips and facial expressions when you are communicating with us. Some people with hearing loss have one ear that is “better” and prefer to be spoken to on their stronger side. If someone you know or love has a hearing loss, take the time to ask them what accommodations you can make to help better communicate with them. We’re doing our best, and are truly interested in what you have to say. We understand that sometimes it can feel as if we are not listening. Please know that we are doing our best to hear and understand you and if we ask you to repeat yourself, it is because we care about what you are saying and want to fully understand you - not because we were haphazardly listening! If you think you may be experiencing some changes in your hearing, please reach out to our friendly team at Hart Hearing today. 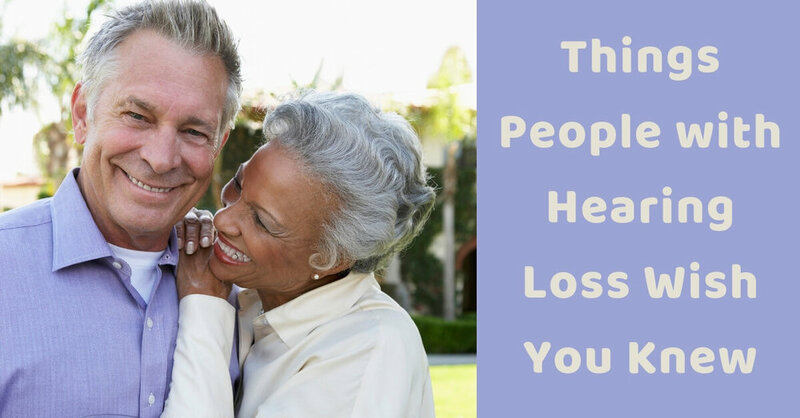 Treating your hearing loss with hearing aids has been proven to be an extremely effective method to help ease frustration during conversations and help bring you closer to those you love. We know to protect our skin with sunscreen when we go out into the sun and our feet with shoes when we walk out onto the street. These are just second-nature activities for us. Did you know that hearing protection is just as important and should be just as automatic as tennis shoes and sunscreen? Tips from the experts at Hart Hearing to help you communicate with people with hearing loss. Recent studies show there are many benefits to getting your hearing tested as soon as possible if hearing loss is suspected. Early detection can mean the difference between a smooth transition into better hearing, or going through the struggles of relearning how to hear. About 15% of American adults 18 years of age and older report having some trouble with their hearing. Based on standard hearing examinations, roughly 30 million Americans (or 13%) age 12 and over have been diagnosed with hearing loss in both ears. That’s around 1 in 8 Americans. 28.8 million adults in the US could benefit from the use of hearing aids. Hearing loss is the third most common health problem in the US, and audiologists are working to raise awareness about hearing health. Do you turn up the volume on the TV, or constantly ask friends and family members to repeat themselves? Do you have trouble following the conversation in a work meeting or community event? If the answer is yes to any of those questions, it’s time to get your hearing checked. “There’s unfortunately still a stigma associated with hearing loss,” says Nicholas Reed, Au.D., an audiologist and hearing researcher at Johns Hopkins University. He notes that people with hearing loss wait an average of eight years to seek treatment for their hearing loss. Here's what to do if you think you might have hearing loss. 1. Start with your family doctor. Your family physician can check for wax buildup and discuss possible medical causes of your hearing loss. Also, be aware that some insurance plans require a medical referral from a doctor to see an audiologist. If that visit doesn’t solve your problem, your next stop should be to an audiologist, a practitioner who specializes in hearing. 2. Schedule an appointment with an audiologist. Ask friends who wear hearing aids to recommend an audiologist. Look for a practitioner who is licensed and certified and who works with different brands of hearing aids, rather than just one. At Hart Hearing we work with the world’s leading hearing aid manufacturers, and our team of audiologists is here to help you hear better. Keep in mind that there’s a difference between an audiologist — a trained health care professional with at least a master’s degree — and a hearing aid or hearing instrument dispenser, who does hearing tests primarily for the purpose of selling hearing aids. The audiologist will do a comprehensive hearing test and check for physical problems. The visit may include a pressure test, (to check your eardrum); a tone test, (to see how you hear different pitches); and a speech test, (in which you repeat sounds). Afterward, the audiologist will go over your results using an audiogram, which will provide a visual representation of your hearing. They will then recommend a course of action. If the audiologist believes that your hearing loss can be surgically corrected, you’ll be referred to an ear, nose and throat (ENT) doctor. 4. Decide whether to try a hearing aid. If your audiologist recommends a hearing aid, take it very seriously. You may want to go home, think it over and come back after you’ve had time to process your diagnosis. When you’re ready, ask your audiologist about the pros and cons of different types of hearing aids. 5. Give yourself time to adjust. Unlike glasses, which correct your vision immediately, hearing aids frequently don’t work perfectly right away. It will take your brain time to adapt to hearing new sounds and background noises. Ask for a trial period, and make sure the hearing device is right for you before committing to a hearing aid. If you’re the only one in your family or circle of friends with hearing loss, ask your audiologist about local support groups, or search online for a local chapter of the Hearing Loss Association of America. It’s important to connect with someone who understands what you’re going through. If you’re ready to do the right thing for your hearing health, add an annual hearing test to your new year’s resolutions, and call us today at Hart Hearing to book an appointment. Although they seem to be separate experiences, hearing loss has been connected with dementia in surprising ways. Both conditions occur most commonly later in life, so it is difficult to determine a causal relationship. In other words, it’s hard to say if hearing loss causes dementia. Yet, the two are correlated in striking ways. Researchers at Johns Hopkins University, including Dr. Frank Lin, have determined that hearing loss is associated with a higher prevalence of dementia. Furthermore, those who develop both dementia and hearing loss tend to have a more rapid decline in their cognitive functioning. In order to understand this relationship, the nature of dementia, cognition, and language may be a clue to the connection between them. Dementia is a cognitive dysfunction that takes many forms. Alzheimer’s disease is one of the most well known forms of dementia, but there are many others, as well. A key feature of dementia is the breakdown of relationships between words and their meanings, as well as memory and spatial understanding. In the first case, many people suffering from dementia find that they cannot connect words with their meanings in the way they used to be able to do. For instance, when they want to describe something, they may not be able to remember the word for it. When that word can’t be located in the memory, they may put together other explanations to get at the meaning of the word. Yet, this process can be a struggle when words don’t have an easy synonym to use for explanation. Others suffer dementia in the opposite direction. Rather than forgetting the words for their ideas, they can no longer remember what certain words mean. This lapse of memory can even extend to forgetting the people they once knew or the locations of things. One possibility for the relationship between hearing loss and dementia has to do with conversation and speech. When a person loses hearing, words or pieces of words may be unheard in conversations. Imagine listening to a person deliver a sentence but only being able to hear one piece of each word. These syllables or phonemes generally link together into meaningful words or sentences. Yet, for the person with hearing loss, they suddenly become a jumble of meaningless sounds. The mind must scramble to put together these sounds, the tone of voice, the image of reading lips, and the expressions on faces into a guess at the meaning that is intended. That process of piecing together a puzzle can be overwhelming to the mind, overloading it with meaningless information or fragments that do not seem to fit together. When the brain encounters such a puzzle time and again, it could create a heavier cognitive load for the brain. This relation between hearing loss and the struggling brain may be a hint at the correlation between hearing loss and dementia, as well. More research is necessary on this connection between hearing loss and dementia, but the fact remains that dementia is closely correlated with hearing loss. Perhaps the struggle in the mind to put together random sounds into meaningful wholes increases the cognitive load on the person with hearing loss to such a degree that dementia is triggered in the mind, or, when dementia has already begun to set in, that makes the cognitive decline more rapid. With untreated hearing and difficulties with speech recognition, there is a higher likelihood for people to avoid the activities they once loved. Rather than struggle through conversation over dinner with friends, people may be more likely to avoid the situation altogether. Over time, increased social isolation could be harmful. In fact, social isolation is a leading risk factor for dementia. Although it remains to be tested in a scientific study, the use of hearing aids may be a way to break the link between dementia and hearing loss. If it can be caught early enough, treating hearing loss with the use of hearing aids may be able to alleviate the struggling mind that grasps to understand what it hears. Are you concerned with your hearing abilities? The first step toward better hearing – and indeed, cognitive function – is to schedule a hearing test. Contact us at Hart Hearing to schedule a hearing test and consultation. We cannot believe that it is already mid-November and almost time for the holiday season. You’re already thinking about all the festivities, family dinners, mistletoe, and holiday cookies. But, have you stopped to consider the holidays and hearing loss? Whether you have a hearing loss or someone you love does, it is important to take hearing loss into consideration to ensure that you and your entire family enjoy the season. When attending holiday parties, it’s important to take location into consideration. For example, you may want to opt for a spot on the couch rather than hang out in the kitchen. The hard surfaces in the kitchen will amplify background noises and cause everyone to begin speaking louder. When sitting on the couch, you will be below the noise of those standing, and the soft surface will buffer some of the racket. During a sit-down dinner, ask to be seated near the middle of the table (so you can see everyone) and next to someone you can count on to help fill in any gaps you may have missed during the conversation. Most people (especially our close friends and family) are more than willing to make accommodations so that we can be comfortable and enjoy the festivities with hearing loss. The biggest problem, however, is that most people don’t know what we need. Take the time to help the host understand what will help you. For example, you may ask her to keep the background music at a lower volume or ensure there are some quieter nooks and crannies for easier conversation. One of the most difficult background noises to converse over is the clinking and clanging of silverware on glass plates and bowls. This noise is significantly reduced when disposable cutlery is used. Many stores such as Costco and Target now offer high-quality plastic silverware that looks deceivingly like the real thing. Best part is that you also get to ditch the dishes. This is a big one. It’s so easy to nod and laugh along with a conversation, even if you didn’t hear enough of it to understand. While it’s convenient, doing this is not good for anyone. It can leave you feeling alone and isolated, and can cause some embarrassing miscommunications. Instead of nodding along, ask others to repeat themselves. Rather than saying “what” or “huh”, rephrase the parts of the conversation you did hear. For example, when talking to your son-in-law about his new job, instead of interrupting with “huh”, you can instead say something like, “I heard you say you got a new job in accounting, but I didn’t catch when your first day starts”. This helps people understand that you really are listening and interested, you were simply unable to hear some of what they said. Rephrasing and asking for repetition do not always work - especially in group conversations. In these instances, it may be smart to use a universal cue such as cupping your hand behind your ear to identify to the speaker that they need to speak up. If you have hearing aids - wear them! Make sure your hearing aids are fit and finely tuned to meet your needs before the holiday parties begin. You can also get a boost from additional technology like assisted listening devices. There are sound amplification devices you can buy from many retailers, and even apps you can download on your phone that will work just like mini amplification systems. Even if you follow all of these tips, you may still face challenges as you approach the holidays with untreated hearing loss. Treating hearing loss with hearing aids have been proven to improve social relationships - especially those with your spouse and close family. Getting your hearing checked may be the very best gift you give yourself (and your loved ones) this holiday season! Contact us at Hart Hearing to schedule a consultation and hearing test today. Are you one of 20 percent of Americans who suffer from hearing loss? Or are you among those who took the time to get fit and pay for your hearing aids only to “forget” or refuse to wear them as advised by your audiologist? Hart Hearing provides hearing aids and audiology services in Rochester, NY.